Women have been playing baseball in the United States for more than 150 years. Some of the first records are from 1866 at Vassar College. Back then, the women played in long skirts. After a woman hit the ball, she had to drape the train of her heavy skirt over her arm before she could run to first base. 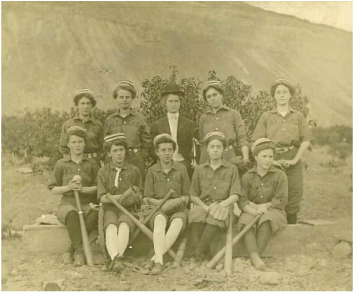 Beginning in 1890, women began playing professional and amateur baseball with "bloomer girl" teams. Other women played together on teams from their towns. Women also played on men's teams. In 1898, Lizzie Arlington signed a minor league contract to play with a team in Pennsylvania. In 1922, Lizzie Murphy played first base with a major league team of American League All-Stars. Six years later, she played an exhibition game with a National League All-Star team. In 1931, Jackie Mitchell struck out Babe Ruth and Lou Gehrig. Even though Jackie's story is unusual, she was just one of many women to play the game. If you'd like to know more about the rich history of women and baseball, take a look at the books listed below. Ila Borders. Southern Illinois University Press, 2005. Women's Baseball. By John M. Kovach. Arcadia, 2005. Women in Baseball: The Forgotten History. By Gai Ingham Berlage. Praeger, 1994. Women at Play: The Story of Women in Baseball. By Barbara Gregorich. Harcourt Brace, 1993.